Unless you want to regularly hire a babysitter, or routinely drop the kids off at the grandparents' house, swapping time with your spouse is one of the easiest and most cost-effective ways to get some time for yourself. I've gone in and out of a "swap routine" like this with my husband when we commit to different activities. A softball league for him, a mastermind meet-up for me, soccer season for him, voice lessons for me. You get the idea. I'm always very aware, almost to a fault, of keeping things fair. So if I'm going to ask for an evening away to hang out with friends, take an exercise class or attend a meeting, I make sure that he has every opportunity to do the same thing and that in any given week, we are both getting time away. The only exception to this, and a tough one to come to terms with, is work travel. It's hardly ever fair. It just isn't. I've found one activity or one night a week for each of us is reasonable and doable, but we are not always consistent with it. I know some moms who plan nights off in advance, just like a date night, and stick to the schedule religiously. That Is Great. They are prioritizing the individual each week and making sure that both parents have time and space to rest, step away or pursue something they love. But do you ever have those times when your kid does something incredibly cute, or you're completely lost on how to react to something your kid says or you just look at your little one and cannot believe you made him or her? What is your knee-jerk reaction in those situations? My reaction is to want to turn to my husband and say "Did you see that? ", "Quick, look!" or "It's so crazy to think we made him..". I want to share it. I want someone to validate my response or agree with me at how cute they are. It's the reason that when I'm alone, even if it's just in that hour after work when I am the first parent home, that I reach for the phone to facetime one of our kids' four sets of grandparents. I want to share the experience with someone who will appreciate it as much as I do. I saw a YouTube interview a while back. My college friend, who was preparing to become a parent herself, interviewed a colleague who was further along in the motherhood journey. We do a lot of the stuff together. Which in a way doesn’t give us breaks necessarily, but it’s just way more fun than doing it by yourself. Is that not SO TRUE? I find that in households with two working parents, it can be easy to always be passing the baton. To cover for each other when you have travel, meetings, networking events or just want some time to do you. And I'm not saying you should stop doing those things. I get it. I need to network, foster my friendships and do other things that require me to pass the baton to my husband on a regular basis. But as much as we can, we really try to do things together. Because it is just more fun. It does feel less lonely. And as Rachel said, it feels more like life. 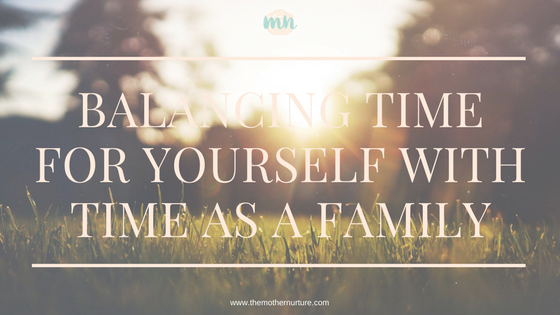 How do you find balance between having time for yourself and sharing the parenting journey by doing things together? I would love to know. katelyn@themothernurture.com.